As explained below, the recommended Galactic emission model for Pass 8 data (gll_iem_v06.fit) was derived from the Pass 7 model after correction for energy dispersion effect. 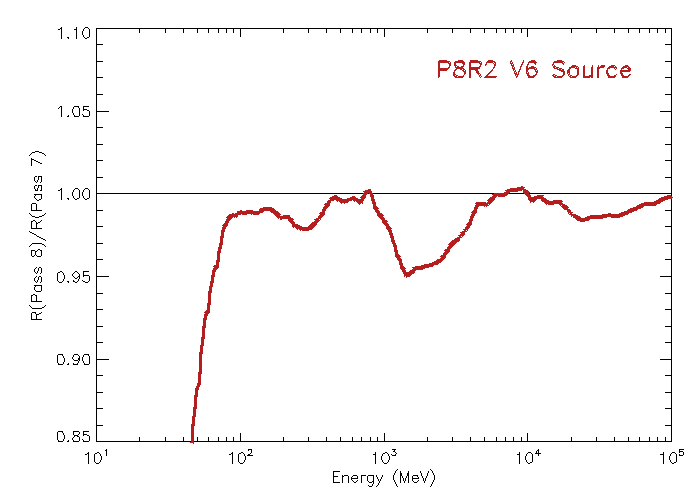 The energy dispersion has not changed from P8R2_SOURCE_V6 to P8R3_SOURCE_V2, so we have not updated the model and gll_iem_v06.fit is the file to be used with P8R3 data. The model for the Galactic diffuse emission represents the intensity of this emission as a function of direction and energy. It is based on the model (described here) that was developed using Pass 7 data (gll_iem_v05_rev1.fit, for the 3FGL catalog analysis). Formally, models of the Galactic diffuse emission are independent of the characteristics of the LAT, in particular the instrument response functions (IRFs). However, because in standard likelihood analyses with LAT data, the finite energy resolution of the LAT is not considered (i.e., measured energies are effectively treated as true energies), some dependence on the IRFs is necessarily implied. In particular, differences between IRFs in the energy dependence of the effective area and of the energy dispersion result in slightly different measured intensities, especially at the low end of the LAT energy range, where the effective area depends strongly on energy. We define the ratio for P7REP_CLEAN_V15. (Operationally, the procedure is a bit more complicated because the energy dispersion and effective area are tabulated separately in the IRFs for Front and Back-converting events. Counts spectra calculated for Front and Back IRFs were combined before calculating ratios.) The second step of the procedure is to evaluate the same ratio of counts spectra for the P8R3_SOURCE_V2 IRFs, . We used the ratio of these ratios to scale gll_iem_v05_rev1.fit to produce gll_iem_v06.fit. The plot below shows the energy dependence of the scale factor. In the central part of the LAT energy range, the scale factor is as large as ∼5% (at 2 GeV). At energies below 100 MeV, where the effective area depends strongly on energy and the energy resolution is relatively poor, the scale factor depends strongly on energy and the correction reaches 15% at 50 MeV. The scaling factors are very similar for other P8R3 IRFs (CLEAN, ULTRACLEAN, ULTRACLEANVETO) and we recommend gll_iem_v06.fit for analyses using these IRFs as well. Because the isotropic diffuse spectral models include residual cosmic rays that are misclassified as gamma rays, and their distribution is different for Pass 7 and Pass 8, we did not attempt to apply a similar scaling procedure for the P7REP isotropic spectra, but instead re-derived them using gll_iem_v06.fit and the P8R3 data.